They stand in silence facing inward from the ocean, as if they are a line of soldiers, of sentries meant to protect the island from whatever might be blowing in from the sea. Thirteen feet, thirteen tons of compressed volcanic ash, basalt, tachyte, and scoria, rubbed with pumice. Their expressions are proud, enigmatic. They’re called “Moai”. Last time on Unsolved Archaeology, we covered Stonehenge in a three-part series discussing who built it, what it was built for, and all of the crazy theories surrounding it. Today, the wonder we’re talking about is no less mysterious. The thirteen-foot-tall stone carvings line the beaches of Rapa Nui, better known as Easter Island. It’s an island that sits in isolation some 2,300 miles west of South America and a whopping 1,100 miles from the nearest neighboring island. Rapa Nui was settled by the Polynesian people sometime around AD 800 to 1200, at the same time that the Byzantine Empire had its height, the Maya were collapsing, and Vikings were raiding all across Europe. The settlers quickly created their own unique culture and language due to their isolation from other civilizations, and these Polynesian settlers of Rapa Nui were the creators of the Moai. But, how were the Moai created? What were they for? What inspired the settlers of Rapa Nui to create these huge, unique sentinels out of volcanic rock, and, beyond that, what happened to the culture that created them? Archaeologists have been debating these questions for centuries! It’s easy to discern where the Moai were cut from. 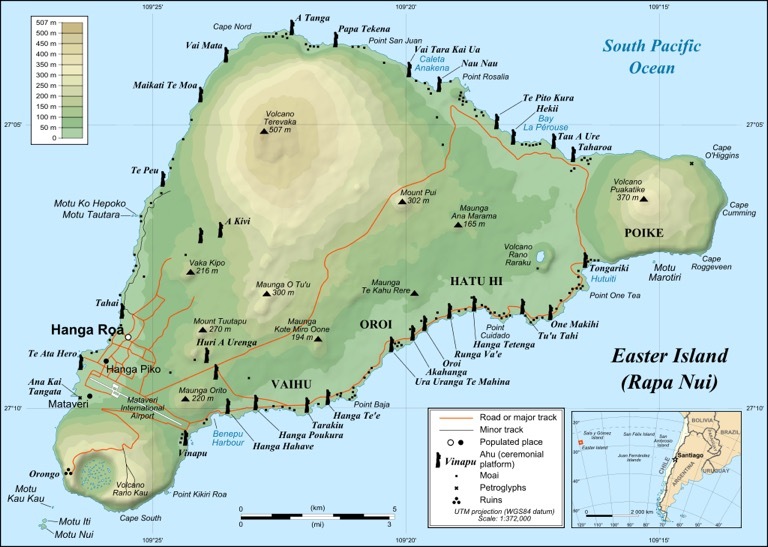 The island of Rapa Nui is volcanic, like all the islands in the area. The statues are cut from tuff, or compressed volcanic ash, basalt, tachyte, and scoria. They were likely quarried directly from the top of Rapa Nui’s volcano. But, how did the islanders manage to lower the statues down the 45 degree slope to the island floor and get them out to the beach and arrange them just so, so close together, all facing the same direction? On the very peak of the volcano rim, Archaeologists have found round holes carved in to the rock. It’s speculated that the islanders placed palm trunks to act as bollards, and, by running ropes around them, they’d have some measure of control as they lowered the statues down the mountain. They would have had to be 600 feet long and three inches thick. Just thinkof all the tree bark that would have needed to be gathered to make it! From there, the islanders would have had to move the Moai to the beach. Some are standing as far away as 15 miles from the quarry where they were made. Originally, it was assumed that rollers were used to haul them along to their places, but this theory was disproved by Professor Charles Love. In order to move the statues along by rollers, the islanders needed flat roads to and from sites, and they didn’t construct such roads. The ancient roads of Rapa Nui are slightly concave, making it impossible for them to be moved by rollers safely. The best theory we have is that the Moai were literally “walked” to their places. The statues found along the roads have a center of mass that causes the statue to fall forward. This momentum could be used to rock the statue from corner to corner, with the use of ropes, and so the statue would take a “step”. So, this theory does seem plausible, but it would require an enormous amount of manpower. Nobody knows how the statues were made or how they were moved exactly, and it’s likely we’ll never figure it out. There just isn’t enough archaeological information to make a guess, but archaeologists, anthropologists, and historians continue to be enamored by this mystery. 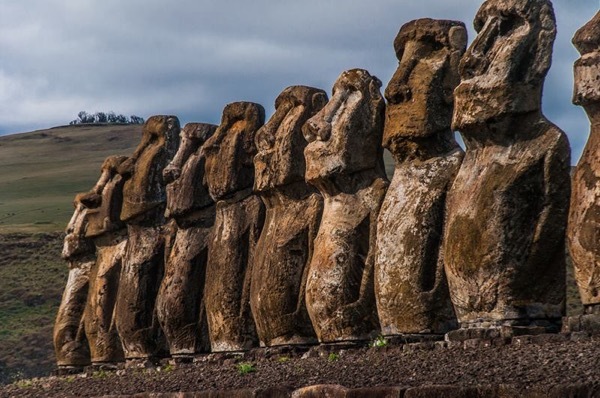 In the next article, we’ll be talking about all of the theories for what these huge statues were for, how they were decorated, what inspired their creators to make them in the first place, and why the settlers of Rapa Nui mysteriously disappeared. Thanks for joining us on this article in Unsolved Archaeology!